CD / SACD / DVD Upgrade products. Most commercial CD, SACD and DVD players can be upgraded for better sound quality. This is one of our most important business areas, and we can offer effective solutions to almost any model. The upgrade products are not tied to the specific model or brand, as the products have much the same effect in different models. Our upgrade solutions start with the LClock XO 3, a high precision reference clock for CD, SACD and DVD players. It is a module that is built into the player, and improves the soundstage width, height and depth, and furthermore gives a more firm and distinct bass. The other weak point of commercial players is that usually the analogue stage consist of low cost / poor performance operational amplifiers. This means that changing these op-amps to better types or even a real Class A analogue filter can dramatically improve performance, and give more liquid and easy flowing sound in the treble, and more warmth to voices. 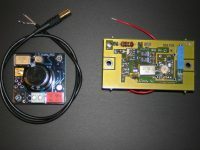 Dual clock outputs with gold plated HF connectors (SMB). Immediate Clock Signal, the capacitor bank is charged before coupled into the active circuit. 3V / 5V output level selectable. 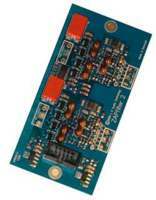 New ultra low noise power supply reference. RG174 coaxial cable with connector for the clock output included. Ultra fast (5,2ns) voltage comparator with excellent S/N ratio. Disable function for i.e. DVD players with standby mode. 4-layer high quality PCB with two screening ground planes. Advanced low noise design (91 active components). The ZAPfilter 2 is a complete analogue stage, which does all the functions from the DAC chip to the output plugs. So it doesn't matter what model or brand it should interface to, but rather the instructions are tied to the type of DAC chip used in your player. Everything on the ZAPfilter 2 is state of the art quality: Vertical linear low noise transistors in pure single Class A mode, filter caps in MICA / Silver types, bypassing is not capacitors, but true shunt regulators, that are linear from DC to 10 MHz. A separate mains power supply is bundled with the ZAPfilter, to make it fully independent of the CD, SACD or DVD player. The ZAPfilter is a costly solution, and will lift almost any CD player up in the high-end class, even modest models, as it turns out that any transport can read discs almost without errors, and most modern DAC chips sound pretty much the same. The ZAPfilter can not make your 200 $ CD player look like a 2000 $ model, but it can sure make it sound like it! Integrated shunt regulators, effective from DC to 10Mhz. Compatible with both current and voltage outputs. Can give any CD player true balanced outputs. Schottky supply with toroidal transformer included.